The video for this story about Lady Liverpool and fundraising efforts for the First World War screened on TV3 News on 4 August 2014. Annette, Lady Liverpool, the wife of Governor Lord Liverpool, inspired women and children throughout New Zealand to contribute to the war effort. They sewed shirts, knitted socks and collected money. Many soldiers expressed their gratitude for the parcels they received from the Lady Liverpool Fund. Annette Louise Monck was born on 23 May 1875 and at age 22 married Arthur William de Savile Foljambe, who in 1907 became 2nd Earl of Liverpool. Lord Liverpool became governor of New Zealand in December 1912, and served continuously until 1920 – as governor until 1917 at which point the office was raised in dignity to governor- general. Both Lord and Lady Liverpool enthusiastically supported fundraising efforts during the First World War – Lord Liverpool championed the St John Ambulance Brigade and New Zealand’s hospital ships, while Lady Liverpool organised a number of women’s and patriotic societies to provide comforts for New Zealand soldiers. Two days after Britain declared war on Germany in August 1914, Lady Liverpool’s appeal to the women of New Zealand was published in many newspapers. Lady Liverpool sought assistance in providing comforts and ‘necessaries’ for serving soldiers of the ‘citizen army’, and suggested that a network of women’s committees be established to achieve her goal. Lady Liverpool urged women to sew shirts and pyjamas, donate materials, clothes, hold-alls (little bags containing items such as a knife, fork and spoon) and ‘housewives’ (sewing kits), and to knit socks, balaclavas, mittens, cholera belts (warm waistbands that were thought to help prevent cholera) and many other items. Thousands of women were attracted to the appeals. Within days, meetings had been held in major centres and thousands of donated items were pouring in. In Dunedin 800 women met to discuss establishing a Lady Liverpool Fund, the largest number ever assembled for a public meeting in the city. Home support for the war effort was widespread. Over 900 women’s patriotic organisations operated during the war, many of which collected money or goods for the Lady Liverpool Fund. These organisations undertook a myriad of fundraising activities to support New Zealand soldiers (abroad or returned), and Belgian and French civilians affected by the war. They included flower sales, fêtes, street collections, auctions of donated items, carnivals and the first Daffodil Day, which was held in Nelson in September 1915. Lady Liverpool was also one of the patronesses of the Lady Liverpool’s and Mrs Pomare’s Maori Soldiers’ Fund, launched in 1915, which organised parcels for Mā ori contingent members overseas (these included dried pipi and preserved muttonbird), and visited wounded soldiers in hospital. Lady Liverpool organised the publishing of two books during the war, the profits of which went to supporting sick and wounded New Zealand soldiers. The first was Countess of Liverpool’s Gift Book of Art and Literature (1915), a collection of stories, poems, cartoons and reproduced paintings. The second, Her Excellency’s Knitting Book (published in 1915 and again in 1917), contained knitting patterns for dozens of items – for soldiers overseas as well as for the family. The objectives of the book, Lady Liverpool wrote, were two-fold: to support the wounded, and to improve one’s proficiency in knitting – a skill Lady Liverpool is known to be very fond of even before the war. The women wait – and knit. Many women, either as individuals or as part of an organisation, took up knitting in their spare time as a way of contributing to the war effort . Knitting had long been practised by New Zealand women, but during the war it took on a new meaning and was more widely popularised. More than 500 nurses served overseas during the First World War, but for the majority of New Zealand women, knitting or fundraising provided a way for them to contribute and to let their husbands, brothers and sons know they were thinking of them. 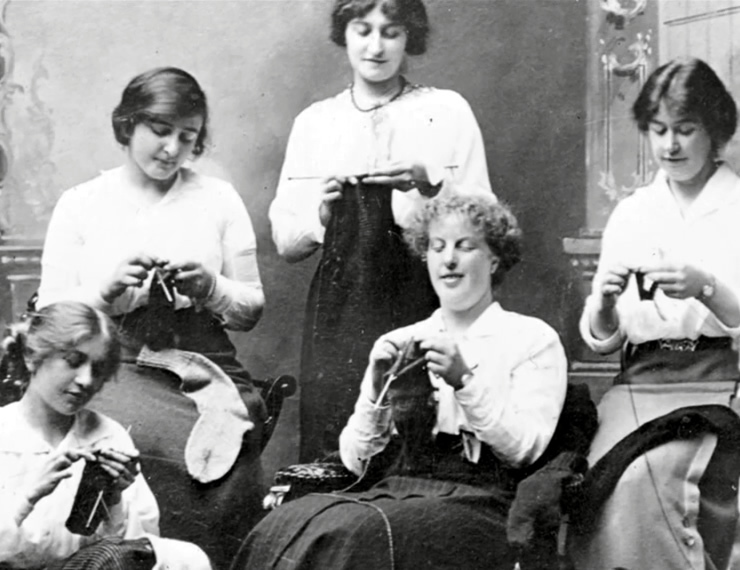 Knitting was often practised in group settings, which brought solidarity and support to women with loved ones overseas. School children were also taught to knit and were encouraged to make items for the Belgian Relief Fund and the Lady Liverpool Fund. With New Zealand’s wartime contribution principally made up of infantrymen, socks for soldiers were in high demand. One soldier claimed in 1915 that a pair of socks lasted no more than two weeks when on active service. When this fact was publicised, Lady Liverpool instigated ‘Sock Day’, when the women of New Zealand were encouraged to knit enough socks to provide every soldier with two new pairs (around 30,000 pairs in total). The sock pattern in Her Excellency’s Knitting Book was contributed by Her Excellency herself. Women who knitted a large number of socks were sent personal letters and awards of recognition, and most Lady Liverpool Fund subcommittees published the names and contents of every single donation received. The level of response by women and children was extraordinary. In August 1916 alone, 130,047 sewn and knitted items were contributed to the Lady Liverpool Fund. Each year the Lady Liverpool Fund sent several parcels to every soldier overseas, especially around Christmas. The basic parcel contained two pairs of socks, one handkerchief, soap and a pencil. Often they included ‘home comforts’, including shortbread and cigarettes, which were designed to remind the soldiers of New Zealand and impress upon them that they remained in the public’s mind. Donators contributing a parcel could assign it to a particular soldier, and individualise it as they saw fit. Lady Liverpool spent many days at the fund’s distribution centres at Wellington, Auckland and Christchurch. From 1916 the Dominion Parcels Scheme utilised spare shipping space to send parcels to Europe at a rate of 24,000 a month. The soldier receiving a parcel was asked to acknowledge its receipt. In recognition of her services to the war effort, Lady Liverpool was made a Dame Grand Cross of the Most Excellent Order of the British Empire in March 1918. ‘Appeal from the Countess of Liverpool’, Dominion, 7 August 1914. ‘For Service Overseas’, Dominion, 8 August 1914. ‘Sabbath-breakers for a Good Cause’, Dominion, 10 August 1914. ‘Loyal Workers: Meeting in the Town Hall’, Dominion, 11 August 1914. ‘Gifts for Troopers: The Queen’s Thanks’, New Zealand Herald, 3 April 1915. ‘Christmas in the Trenches’, Dominion, 16 July 1917. ‘Lady Liverpool Fund: Depot Notes’, Press, 18 August 1917. The following letter extracts are from the manuscript collections of the Alexander Turnbull Library. Letter from Mr Francis Farr Esq. to Lady Liverpool, 14 March 1917. In Lady Liverpool scrapbooks, P f920 LIV SCR 1912-1920, Vol. 5. I desire to offer to you my sincere appreciation on the valuable services you are rendering to the Dominion of New Zealand. Wishing you the very best of health happyness [sic] and prosperity and trust you will uphold the honour of our Dominion and the Empire in this great crisis and extend to you my goodwill on the work you have so kindly taken up on behalf of New Zealand and our beloved Empire. Letter from Annette Liverpool to Anna Wharo, May 18 1915. Riddiford family papers. MS-Papers-5714-104. Dear Anna Wharo! Thank you very much indeed for that nice parcel of socks. You are so good about helping and your socks are always such nice ones…The socks are pouring in and other things too + I think we shall be able to send the 30,000 pairs; we want every man to get a parcel. Letter from Annette Liverpool to Captain Seddon, June 25 1918. Seddon family papers, MS-Papers-1619-146. I spent this morning sewing at the Red Cross Depot + on Friday I am going down to sell roses at the stall they have in Queen St. I never did such a thing before + feel rather nervous! The roses are very pretty artificial ones made by crippled girls at home… Thank you so much for all you say about the parcels – It is good + keen they all appreciated + we really get a great many thanks. Letter from Sydney S Shelton to Lady Liverpool, 16 October 1918. In Lady Liverpool scrapbooks, P f920 LIV SCR 1912-1920, Vol. 6. It will no doubt be of interest to you to hear of the wonderful amount of knitting work accomplished by Mrs Gardner of Rangataua for the boys at the front. Mrs Gardner is over seventy five years of age and has failing eyesight, which makes her achievement specially praiseworthy and deserving of recognition from head quarters. ‘Countess of Liverpool Fund’, in Lady Liverpool scrapbooks, P f920 LIV SCR 1912-1920, Vol. 4. The Countess of Liverpool sent a number of camellias to the Town Hall on Saturday … to be sold by the children of the Salvation Army Home, on behalf of the fund … Among the varied donations to the fund is an old silver watch, its case worn smooth, given by a Maori to be sold for the cause. A little maid of Halcombe has sent a tiny New Testament bound in red leather and enclosed in a case; and a little Seatoun girl sent by post her small gift of a card of buttons for one of the housewives. Small things these in themselves, but great as symbolising the self-sacrifice and eager service that is shown by everyone in these dark days. ‘Lady Liverpool Fund Annual Meeting’, in Lady Liverpool scrapbooks, P f920 LIV SCR 1912-1920, Vol. 4. Newspaper article depicting a letter sent from G. P. Hanna, 2nd Light Trench Mortar Battery, NZEF, 30 October 1917, addressed to the secretary of the Lady Liverpool Fund, and has a watermark reading ‘A merry ‘Xmas, thank you all’. In Lady Liverpool scrapbooks, P f920 LIV SCR 1912-1920, Vol. 6. ‘Nothing like a parcel to cheer a Chap up!’, The Star, 23 February 1918, in Lady Liverpool scrapbooks, P f920 LIV SCR 1912-1920, Vol. 6. The Lady Liverpool Fund is a New Zealand organisation composed of entirely voluntary workers which sends 24,000 parcels every month to our boys in the trenches – that is, a parcel a month for every man there. Every parcel is worth 7/6 here. To a soldier boy they’re worth untold gold. The food he was used to – the brands he knew – the “smokes” he used to enjoy. It brings “home” so close – brings the “home” touch with it – and home is beyond price. Thousands of appreciative letters from the “boys” encourage us to go on. “Nothing like a parcel to cheer a chap up!” says one. How characteristic of these letters … We have reached a point when we must appeal. This great work MUST be continued. Our boys expect it… With your help we can send more parcels – or bigger parcels. ‘Christmas Parcels and Puddings for Our Boys in France: Four Hundred Cases Leaving Christchurch Depot of the Lady Liverpool Fund for the Christchurch Railway Station on August 2nd.’ Weekly Press, 14 August 191[? ], in Lady Liverpool scrapbooks, P f920 LIV SCR 1912-1920, Vol. 6. For some weeks past the workers at the Lady Liverpool Fund depot in Christchurch have been busily engaged in packing the Christmas parcels and puddings for New Zealand soldiers on active service. Recently an Egyptian shipment, comprising about 40 cases of parcels and puddings, was sent forward. The major portion, however, was not despatched until August 2nd, when, promptly at 2 p.m., several big lorries left the depot laden with 400 cases of Christmas comforts for the boys in France. The reason for the shipments being made so early this year is due to the uncertainty of shipping space, the Society having to take immediate advantage of whatever space is given from time to time. Even after the despatch of these cases there will be no slackening of activity at the depot, as there are still about a hundred cases to be filled and packed, in addition to the usual monthly supplies, which go forward with clockwork regularity. Edmond, Lauris, ed. Women in Wartime: New Zealand Women Tell Their Story . Wellington: Government Printing Office, 1986. Else, Anne, ed. Women Together: a History of Women’s Organisations in New Zealand: Nga Ropu Wahine o Te Motu. Wellington: Historical Branch, Department of Internal Affairs; Daphne Brasell Associates, 1993. McLean, Gavin. The Governors: New Zealand’s Governors and Governors-General . Dunedin: Otago University Press, 2006. Nicholson, Heather. The Loving Stitch: a History of Knitting and Spinning in New Zealand . Auckland: Auckland University Press, 1998. Women fundraising for Belgium, First World War, a story on NZHistory. Knitting for Empire, information about Her Excellency’s Knitting Book on NZHistory. Knitting for the troops, children knitting for the war effort on NZHistory. Knitting, spinning and weaving, a story on Te Ara. Daffodil Day – supporting 'our boys', a story about the first Daffodil Day, on The Prow. Lady Liverpool, a short biography. Pōmare, Mildred Amelia Woodbine, a biography of Mildred Pōmare on Te Ara.